Congratulations to John Schank, the Alaska Trucking Association’s Driver of the Year! 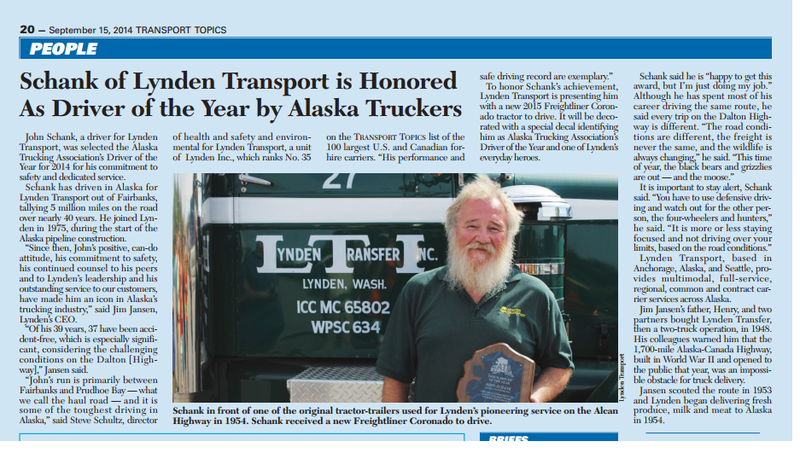 For almost 40 years – driving nearly 5 million miles – John has represented Lynden and set the standard for drivers in Alaska. Please join us in congratulating and thanking John for his many years of safe, exceptional driving! “You’re not in charge of your own destiny when you’re on a boat,” says Captain Keith Colburn during a particularly rough patch at sea. 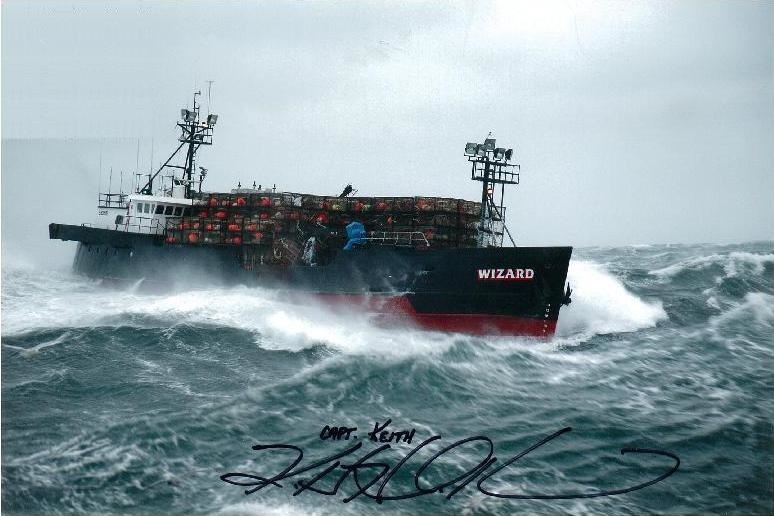 The TV program “Deadliest Catch” pits crab boats like Colburn’s Wizard and their crews against the deadly Bering Sea during King crab season. It is this chaotic, unpredictable environment that makes the show must-see TV for millions of Discovery Channel viewers. That kind of stress leads to frayed nerves and tense moments. 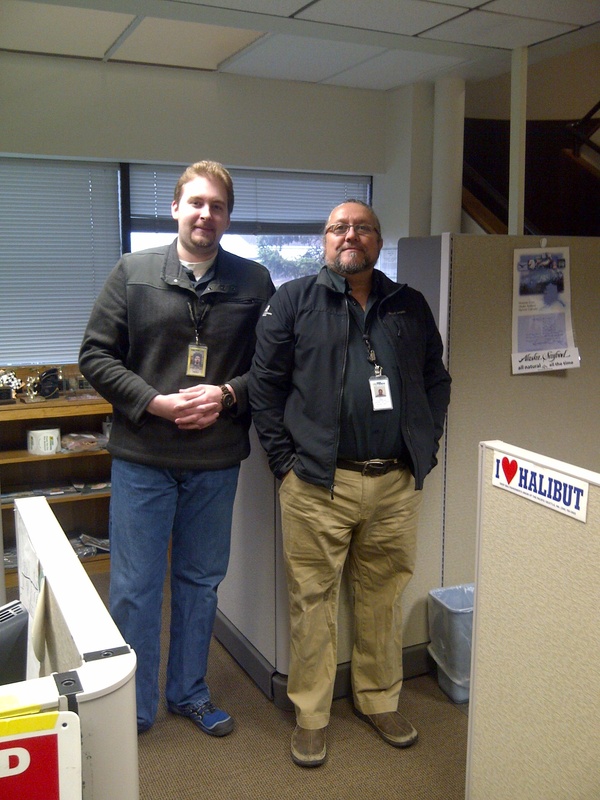 As the transportation provider, the Lynden team does its part to keep things calm and focus on solutions. “We hear things like divers are hitting the water in three hours, or weather is moving in. Urgency is the norm with these shipments,” Obeso says. January is the busiest time with all three shows in production and Lynden handling shipments from three different producers and production teams to different locations in Winnipeg, Nome and Dutch Harbor. Lynden’s variety of transportation modes is a distinct advantage. “We have used Lynden Air Cargo’s 4-day-a-week scheduled service from Anchorage to Nome and, at other times when the freight is not so time sensitive, we have trucked and barged freight via Alaska Marine Lines and Lynden Transport,” explains International Agent Owen Mitchell. A special Lynden customer service email and team has been set up to handle the daily and often three-times-daily shipments during production. The group is available 24-7 to respond to requests and issues. In addition to Deadliest Catch, Original Productions produces Ice Road Truckers, Bering Sea Gold and even a program called Whisker Wars. Before Lynden came onboard, another freight forwarder was handling transportation for the shows. At one point freight was grounded in Sand Point, AK, which is 600 miles west of Anchorage and only accessible by boat or plane. “They were facing a two-week wait to get the freight out so the forwarder contacted us and we got the freight on another airline’s backhaul flight the same day,” Mitchell says. 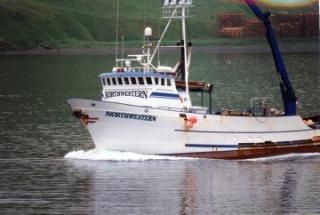 By coincidence, Obeso was in Dutch Harbor at the same time working on projects for the seafood industry. “I happened to meet Producer Sheila McCormick through mutual contacts while she was filming land shots for the Deadliest Catch. I mentioned that the brokerage firm she was using was calling Lynden for help and that she could just call us directly in the future,” Obeso recalls. 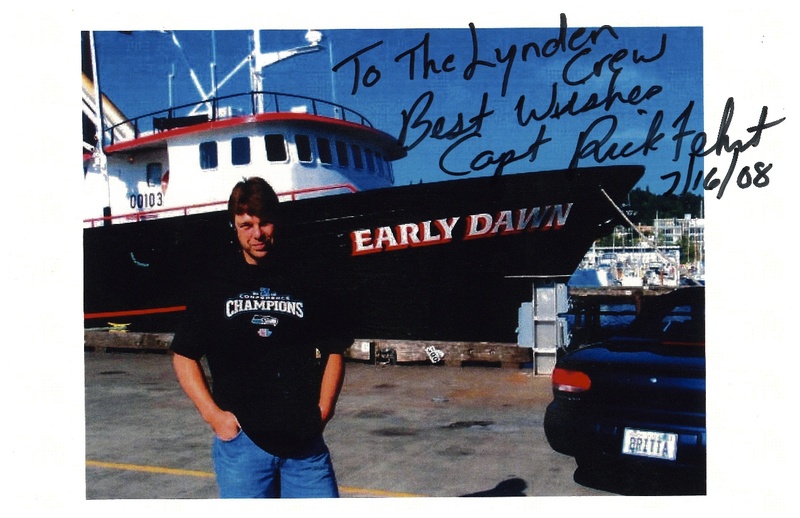 “That started this great working relationship that we have today.” Lynden began handling shipments for Deadliest Catch and six months later, the producer of Ice Road Truckers called. They were transitioning the program from Prudhoe Bay to Manitoba to begin filming in Canada. Lynden’s office in Ontario was a selling point as shipments could be routed into Winnipeg through Ontario instead of Anchorage and Lynden could handle all the freight plus customs brokerage, importing and exporting. Lynden now supports other programs such as Bering Sea Gold filmed in Nome, AK. One of the more challenging assignments was flying a large gold nugget into Nome for the series. For Ax Men, freight has been flown and barged into Southeast Alaska and, for the Whisker Wars program, Lynden took care of a large international shipment to Germany for the taping of the world beard competition. “Over the years, we have chartered flights and arranged transport of tri-pods, production equipment, wet suits, dive tanks, air compressors, arctic gear, ATVs, yurts and more,” Mitchell says. 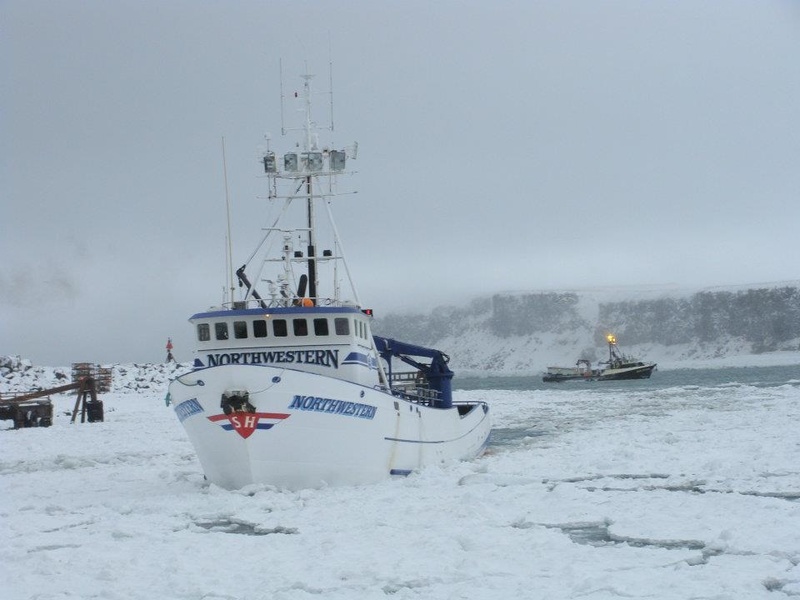 “We even flew gear to Adak in the Aleutian Islands where a boat met us to pick it up. Lynden’s worldwide presence – especially in Russia, Canada and the Yukon – is a plus for producers as they scout new locations for programs. Both Obeso and Mitchell agree that the work is challenging, but also exciting and a lot of fun. “It’s definitely something different than the normal shipments we handle,” Obeso says. “We consider ourselves the ‘calm behind the storm’ to keep things rolling during production. Reality television is fast-paced and deadline-focused. We work well under pressure and try to ease the load of the producers in the field.” For Obeso, who spent many years working in the seafood industry, one of the most memorable shipments wasn’t delivered to a remote filming site, but to a suburban location. Lynden flew 500 pounds of coveted blue crab from Alaska to Burbank for a Deadliest Catch season premier. From a Taco Bell promotion in Bethel to Pitbull visiting Kodiak, Lynden has provided support for several high profile projects in Alaska this past summer. The Miami rapper visited Kodiak (population 6,300) after a marketing campaign invited people to go to Facebook and “like” the Walmart location where they wanted him to be sent. The promotion went viral when Boston Journalist David Thorpe suggested that people send Pitbull to the most remote Walmart in the U.S. When voting closed July 16, Walmart’s Kodiak location had more than 70,000 “likes” on its Facebook page, making it the clear winner. “Walmart contacted us to help them get the stage and sound system equipment from Anchorage over to Kodiak in time for the show,” says Mark Graves, Lynden Transport Service Center Manager in Anchorage. “The timeline was very short and required loading two 28-foot trailers to move via ferry from Homer to Kodiak. The challenge was getting all this equipment moved back from Kodiak to Anchorage in one day because the vendors needed it for a concert the next day.” Lynden’s Anchorage and Kenai operations teams worked together to get everything loaded and moved to Homer in time to make the ferry and returned to Anchorage for delivery back to the vendors. During his visit to Kodiak, Pitbull appeared at a community event at the U.S. Coast Guard base attended by about 250 people. The rapper also received the keys to the city and visited staff at the Kodiak Walmart (above) where he was presented with a survival kit that included bear repellent. 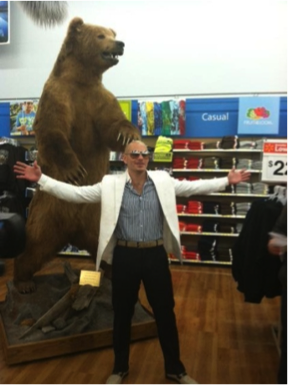 Pitbull stayed in Kodiak for three hours before flying out to continue his tour. 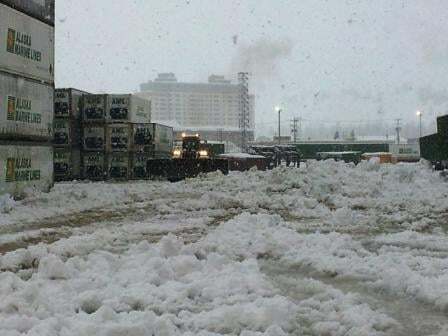 Historic storms hit Alaska and Washington this winter and Lynden companies pulled together to keep the freight moving and equipment operating in the harsh temperatures and record snows. Hardest hit is the Railbelt in Central Alaska while Whittier, Fairbanks, Anchorage and Kenai have had adverse weather for most of the winter. Whittier has had 380 inches of snow this winter, and Valdez has received 403.9 inches of snow and is considered the snowiest locale in America. Cordova and Whittier are not far behind. Anchorage has had over 10 feet of snow this year. “With snowfall expected to be heavy in March*, we have a shot at the all-time record,” says Scott Hicks, Vice President of Operations for Alaska West Express. 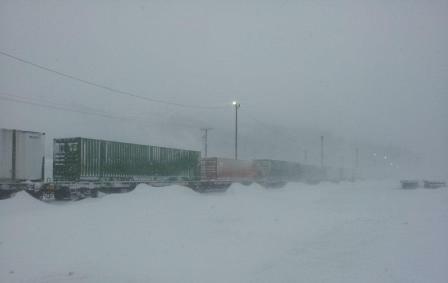 Conditions at the Alaska Railroad Corp. yard in Whittier, AK. Compounding problems was a cycle of storms which hampered barge arrivals off and on since October. The Whittier terminal has been dealt further blows by storms which bring heavy snow, then melting conditions. The cold temperatures cause train wheels to freeze onto the tracks and make rail, truck and forklift operations very difficult. “We have experienced crippling conditions for rail and cargo operations,” Scott explains. Excessive ice buildup throughout the terminal shut down all rail movement in or out of Whittier for days. 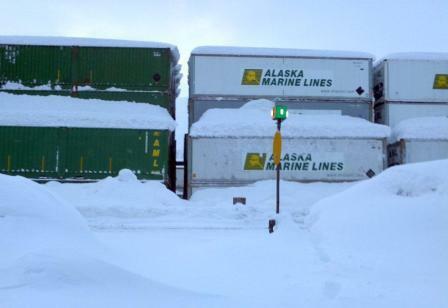 Avalanches caused train delays extending the time required for loading and unloading our barges, and tug crews have battled through storms, rough seas and lengthy voyages. In Washington, winter storms also brought freezing rain, heavy snow and extended road closures on Snoqualmie Pass due to avalanches. The governor declared a state of emergency and waived the hours of service limits for drivers hauling milk from farms to processing plants. As a side-note, LTI, Inc. delivered a record amount of road de-icer salt this winter to the Washington Department of Transportation and the City of Seattle. During January, LTI, Inc. trucks moved 30,771 tons of bulk salt from stockpiles at Seattle and Moses Lake to maintenance sites around the state. * Note: This article was originally written in mid-March, 2012. 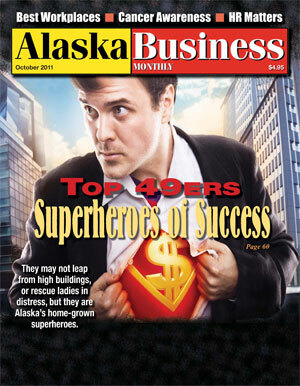 Alaska Business Monthly magazine ranked Lynden Inc. #7 among Alaskan-owned and operated companies. Lynden provides 700 jobs in Alaska and almost 2,200 jobs worldwide. “These Top 49er companies show strength and power,” said Jim Martin, president and general manager of Alaska Business Monthly. “They are our Superheroes of Success. I have studied these companies for years and am amazed by their flexibility, growth and wisdom." 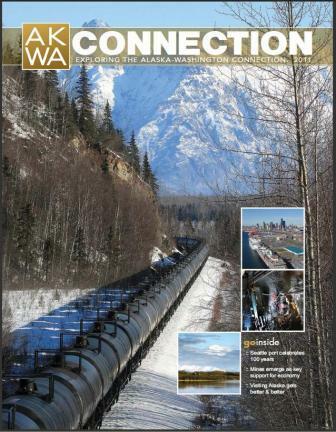 You can read more in Alaska Business Monthly's report (PDF) on the Top 49 Alaskan-owned and operated companies. Lynden strives to efficiently move freight with the highest regard for the health and safety of our employees, and with the utmost care for the environment. To learn more about our environmental policy, check out our Environmental Page. For more information on the principles Lynden strives to manage our business by, view our Green Brochure. 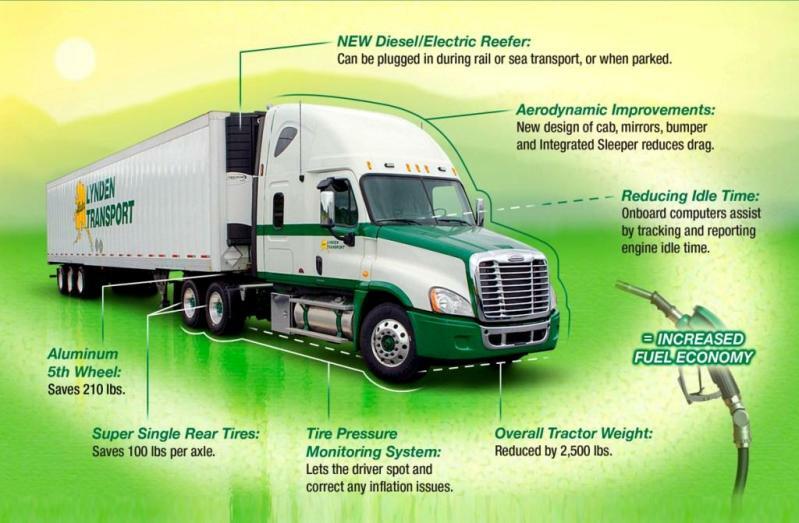 The graphic below breaks down our new Lynden Transport trucks, showing how the different features help contribute to environmental efficiencies. ANCHORAGE – Lynden Transport’s industry leading EZ Tracing system just got better with the addition of GPS mapping of shipment locations while in route over the highway. By clicking on a link on the Lynden Transport website, customers can monitor their shipments on a digital map that shows the truck as it moves from origin to destination. Lynden Transport is the only Alaska trucking company to offer this live tracking service to its customers. The company also launched a brand new website, www.lynden.com/ltia, redesigned based on customer feedback for easier navigation. “We are very interested in customers’ ideas to improve service and value,” says Jim Beck, Lynden Transport President. “Lynden Transport has some long highway routes such as from Texas to Alaska and our customers requested that we provide more than depart and arrive status. With the new GPS live tracking maps we can provide multiple location updates per day. GPS mapping is the latest addition to Lynden Transport’s other recent service improvement, Predictive Delivery, which provides customers up-to-date delivery times for their shipments in major services centers in Anchorage, Fairbanks, Kenai, Juneau and Ketchikan. The EZ Tracing GPS mapping feature is automatically engaged each time a shipment is viewed through the EZ Commerce system. If you would like to sign up for Lynden’s free EZ Commerce program, go to www.lynden.com/ltia and click on the “sign up now” link, or call your local Lynden representative. 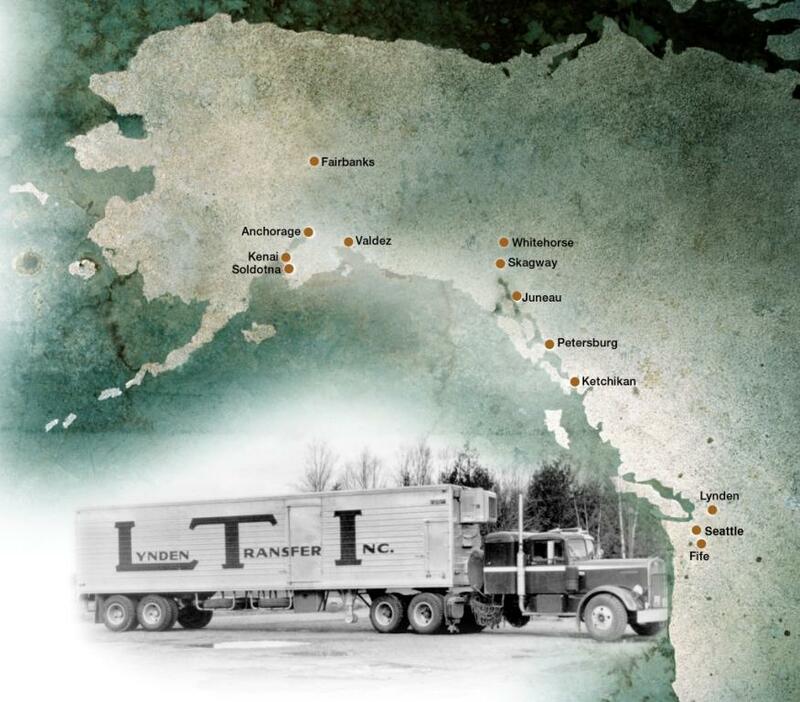 Lynden Transport is the trusted leader for trucking to Alaska. Its network of service centers is the largest in Alaska and provides extensive coverage with integrated truck, marine and air services. The Lynden family of companies combined capabilities include: truckload and less-than-truckload transportation, scheduled and charter barges, rail barges, intermodal bulk chemical hauls, scheduled and chartered air freighters, domestic and international air forwarding, international ocean forwarding, customs brokerage, trade show shipping, remote site construction, sanitary bulk commodities hauling, and multi-modal logistics. Lynden companies are repeat winners in the annual Quest for Quality customer service awards presented by Logistics Management magazine. Have you seen the new Lynden Transport website?